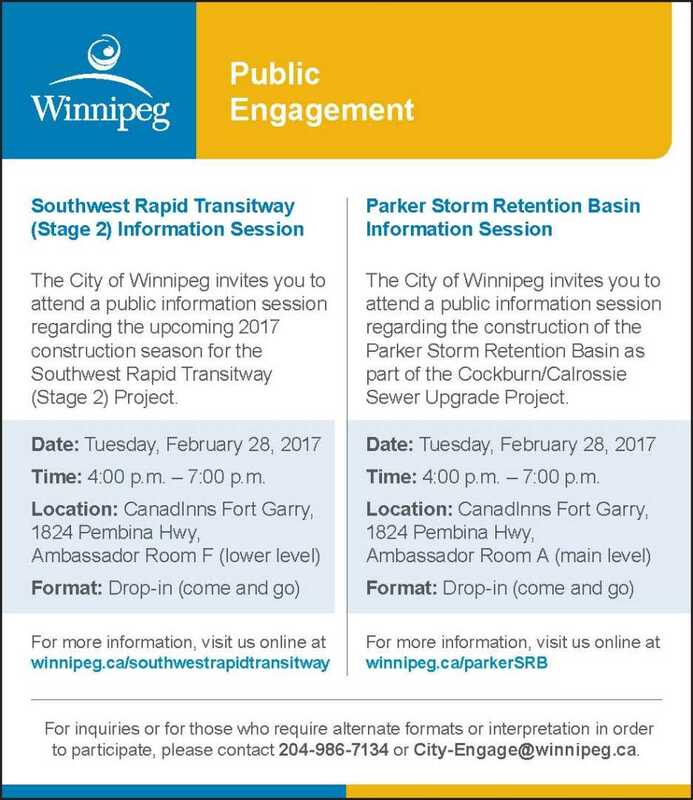 Please join me on Tuesday, February 28 for TWO public information sessions being held at CanadInns Fort Garry, 1824 Pembina Highway. Construction of the Southwest Rapid Transitway (Stage 2) Project began in August, 2016 and will continue this year with the development of key elements including the Bishop Grandin, Letellier and McGillivray overpasses while work on the Parker Storm Retention Basin, a constructed wetland designed to store runoff as part of local sewer upgrades, is expected to begin this spring. As both projects are located in the same area, the information sessions will be held concurrently. Visitors will have the opportunity to visit different rooms within the venue to learn about planned construction activities, schedules and designs for each project. When Stage 2 of the project is complete and operational in 2020, the Southwest Rapid Transit Corridor will link Winnipeg’s downtown to Winnipeg’s southwest neighbourhoods, including the University of Manitoba and Investors Group Field. 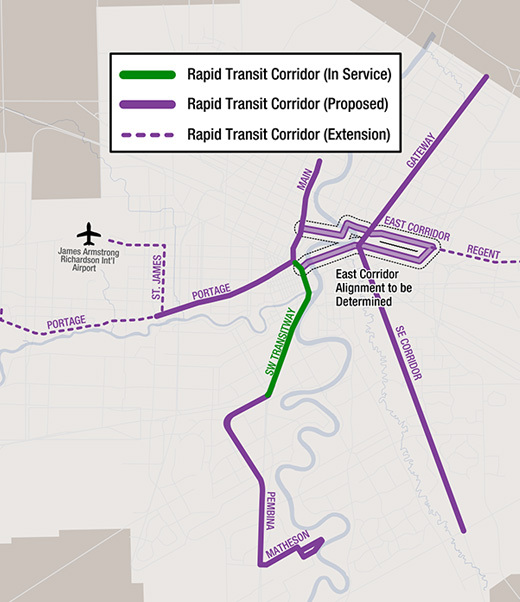 Existing feeder routes in the southwest quadrant of the City will connect with the rapid transit corridor. For more information, visit Winnipeg.ca/southwestrapidtransitway. You can also view our presentation boards. In River Heights-Fort Garry, changes to the Cockburn West and Calrossie sewer districts are required to reduce the impacts of combined sewers, namely basement flooding and the release of diluted wastewater into local waterways. The project includes sewer separation and creation of the Parker Storm Retention Basin. For more information, visit winnipeg.ca/parker SRB. You can also view our presentation boards.